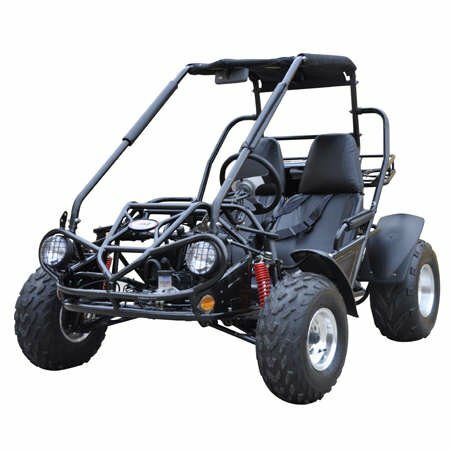 Buyers seeking a faithful workhorse go-kart that also offers a comfortable and refined ride should look no further than BV Powersports TrailMaster 150 XRS buggy. This machine has been a staple to our go-kart lineup for many years. The 150 XRS is a tough, no-nonsense go-kart for riders who are tackling demanding trails, and who want performance and reliability that has made TrailMaster famous. Built around a stout 150cc, air-cooled, engine the chassis offers smooth full suspension with long travel and hydraulic disc brakes. Reverse? It's standard equipment too. The 150 XRS is the refinement and comfort that let you spend all day in the seat. An all-around contender in the 150cc category, the 150 XRS is extremely fun to drive and a solid choice. The TrailMaster 150 XRS go kart is the best built 150 cc buggy on the market. This offroad go-kart is designed for a wide range of riders from 10 years old to 90 years old. The TrailMaster 150XRS is roomy with a dash forward, open cockpit design. There's a lot of leg room for the big guys. The tilt steering wheel can be adjusted so that the youth rider can see over it. The driver's seat is also adjustable to accommodate a wide range of drivers. The seats in the TrailMaster 150cc are wide with no side bolster to pinch larger riders. Also, the 150 XRS comes standard with 5-point racecar style seatbelts. These features along with tall side rails and high top bars make for a comfortable and safe go-kart. The 150 XRS uses oil filled coil over shocks for a smooth and controlled rebound ride. With an overall ground clearance of almost a foot (min. 6.7" at rear sprocket guard) and large ATV tires, the TrailMaster 150 XRS can get over logs, rocks and traverse shallow creek crossings. The 150 XRS steering geometery is similar to a truck with tall spindles and automotive style ball joints for long-term durability. The front axle is wider than the rear for stability and anti-plow effect (when the superior traction of a locked or live rear axle tends to push the vehicle straight ahead even though the front wheels are turned). The TrailMaster's short wheelbase allows for tight turns to maneuver around trees and obstacles to get you down the trail quickly and safely. This buggy uses all wheel drive hydraulic disc brakes with twin piston master cylinder for excellent stopping power. All wheel bearings are double sealed (like an expensive ATV) in order to keep dirt and water out. Available in Green, Black, and Blue, Yellow, Red, Orange.